Leading Manufacturer of 340v label roll rewinder machine, label counter rewinder machine and automatic label roll rewinder machine from Ahmedabad. The SR Automation 340V Label Roll Rewinder Machine useful for offline printing application. Label counting and offline Label Application on Sticker label roll. 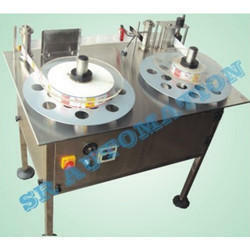 The standard machine consists of Label roll Un-winding and Rewinding Unit with Variable Speed Controller. The machine counting with auto stop facility for Label Counting / Batch Coding Unit. Riding on unfathomable volumes of industrial expertise, we are providing a broad array of Label Counter Rewinder Machine. Automatic Label Roll Rewinder Machine useful for offline printing application. Label counting and offline Label Application on Sticker label roll. 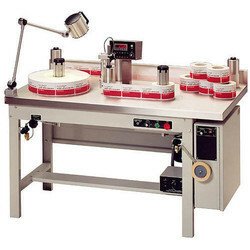 The standard machine consists of Label roll Un-winding and Rewinding Unit with Variable Speed Controller. The machine counting with auto stop facility for Label Counting / Batch Coding Unit. Economical design incorporating high reliability and low maintenance. Fully Automatic Operation controlled Through PLC – MMI Controller.